Probably the only Argyle player whose surname and birthplace are the same – Douala was born in Douala, the largest city in Cameroon. He joined Argyle on a short-term deal after his contract was cancelled by Greek side Astereas Tripolis. 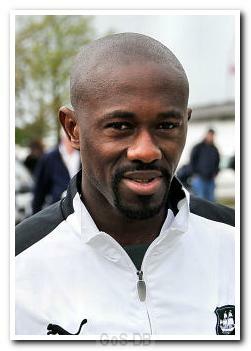 A Cameroonian international striker (17 full caps and one goal between 2004 and 2009), he began his career with Saint-Etienne in France and also played for Boavista, CD Aves, Gil Vicente, Uniao de Leiria, Sporting Lisbon and Portsmouth for a loan spell in 2006. Douala made just two appearances for Argyle and was not offered a permanent contract. In March 2010 he signed for Belgian side Lierse SK, playing 11 times and scoring twice in 2010-11.